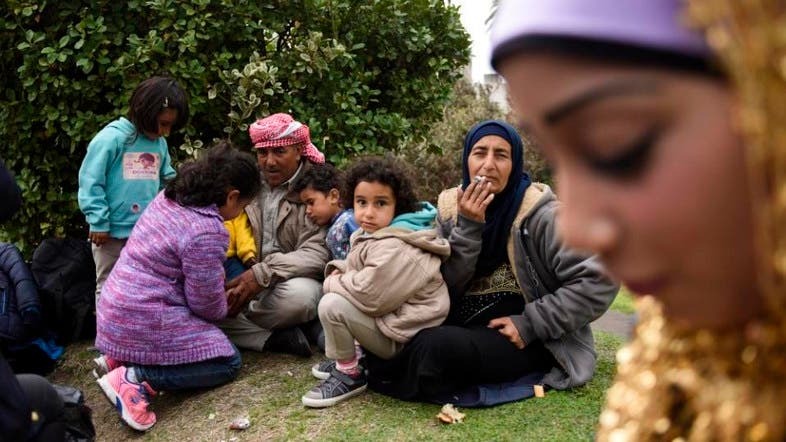 Syrian refugees protested outside the Uruguayan presidency Monday to demand authorities help them leave for other countries, saying the nation that gave them sanctuary is too expensive and they have scant economic opportunity. Uruguay welcomed the 42 refugees fleeing Syria's civil war in October 2014, but the five families now say officials promised more than they could deliver. "There's no future for us here. The government's aid plan lasts two years, and one has passed by," Ibrahim Al Mohammed told The Associated Press. Al Mohammed said he can't get by on just 11,000 pesos ($380) a month as a hospital worker, barely above Uruguay's 10,000-peso minimum wage. "I have a wife and three young sons," he said. "What will I do to earn a living when the help runs out?" The refugees lack passports from their home country, and cannot get Uruguayan ones because they are not citizens. The government has provided them with Uruguayan IDs and travel documents, but not all countries recognize them. In August, one of the families tried to travel to Serbia but was held for 23 days at the Istanbul airport. Ultimately they returned to Uruguay. "I understand them. They realize that leaving Uruguay is very hard and that creates a great deal of insecurity," said Javier Miranda, head of Uruguay's Human Rights Secretariat. "But the travel document that Uruguay gave them is valid. What we can't do is force third countries to accept it because it's out of our reach." Miranda defended the refugee program, saying Uruguay hopes the Syrians could have a dignified life here. He acknowledged the country is relatively costly, but said the job offers are the same for everyone and aid cannot extend beyond two years. Maher Aldees's family, the one that got stranded in Istanbul, had been living in the coastal city of Piriapolis, where local officials accused the parents of not sending their daughters to school. Authorities later said the issue was resolved. Aldees said they now want to travel to Syria or Lebanon and intend to protest outside the presidential offices until authorities take them to the airport. Another family, the Ashlebis, also arrived with their suitcases and vowed to remain as long as necessary. "They told us a lot of things that never came true," Ibrahim Ashebli said. "They told us this country was cheap, and it's expensive. Money is not enough. There's no work." Under ex-President Jose Mujica, Uruguay agreed to take in 120 Syrian refugees. A second group of seven families is supposed to arrive later this year, and Foreign Minister Rodolfo Nin Novoa has rejected criticism from those who say Uruguay should not receive any more. President Tabare Vazquez, who took office in March, said in his inaugural speech that a "profound analysis" was necessary before Uruguay accommodates more Syrian refugees. Since civil war broke out in 2011, more than 4 million Syrians have fled the country, more than any other refugee crisis in almost 25 years, according to the United Nations. Syrian refugees put Arab twist on Oliver!